Let me tell you a little story about my bathroom. Yes, my bathroom. I promise, it’s not boring. Plus, you’ll hear some embarrassing facts about me! Interested? Like most moms of little boys, I wrestle with certain challenges in my bathroom when it comes to Jake: poor aim and an inability to lift the seat. I also have three dogs who occasionally drink out of the toilet and a cat who thinks the toilet is a splash pool at a waterpark. Oh, and did I mention the toilet doesn’t flush all the way unless you hold the handle down for a full minute. If my little boy doesn’t remember to lift the seat, do you think he remembers to do that? Let’s not even talk about the sleepwalking fiascos, where he’s mistaken the floor or shower for the toilet. I don’t think he’d want me to mention those! Oops. Then there’s the rest of the bathroom, and this is where I divulge embarrassing info about me. I have thick hair. A lot of it. I shed worse than my three dogs combined. 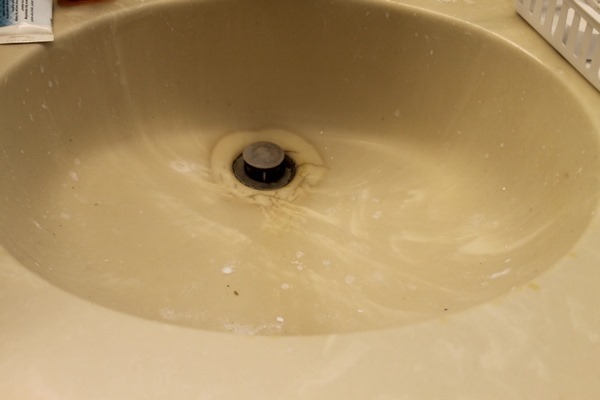 It clogs the shower drain, which in turn leaves water sitting in the bottom of the shower. That, of course, leads to…dun, dun, dun…soap scum. I’m not alone. 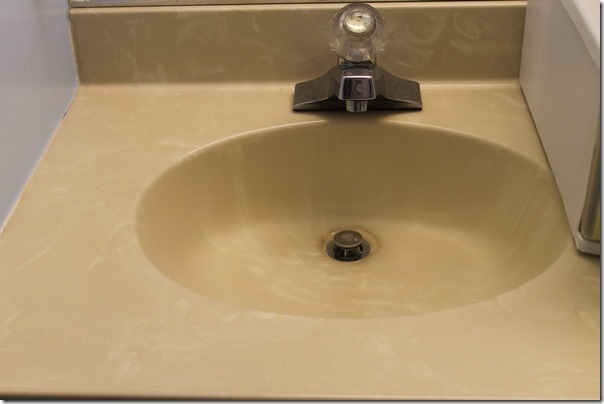 According to the Scrubbing Bubbles® Dirty Work Index, 47 percent of people leave their hair all over the bathroom. I don’t just leave hair all over, I leave hair dye everywhere! I try REALLY HARD to avoid it, honestly I do. When you have as much hair as I do, though, you’re bound to have mishaps. I am super careful to get them up as fast as possible though, because I don’t want to leave stains behind. Not good when you’re renting! I dye my hair various shades of burgundy in an effort to achieve that perfect plum I’ve been lusting over for years. When I’m done with my shower, it looks like that scene from Psycho, except, you know, in color. My final embarrassing bathroom fact: I spend less than 20 minutes a week cleaning it. Think that’s embarrassing? Guess what? The recent national survey conducted by Scrubbing Bubbles® revealed that over half of Americans spend 20 minutes or less each week cleaning the bathroom. That’s less than 20 minutes to clean all the messes my son, my pets and I make in an average week, including toothpaste gunk in the sink and the remnants of my latest makeover experiment. Two days before our big family holiday party was “deep clean Nikki’s bathroom so guests don’t think she’s a total slob” day. Thank the lucky stars, my sample of Scrubbing Bubbles® Multi Surface Bathroom Cleaner arrived three days before the party, just in time for me to do the Complete Clean. Since I’m sharing secrets, here’s another one: I originally bought Scrubbing Bubbles® long ago because I like the funny talking Bubbles characters. I’m a total sucker for anthropomorphism (giving human qualities to typically inanimate objects). I am highly amused by talking animals and objects. If it shouldn’t talk and it does, I love it. Except dolls. Talking dolls freak me out. 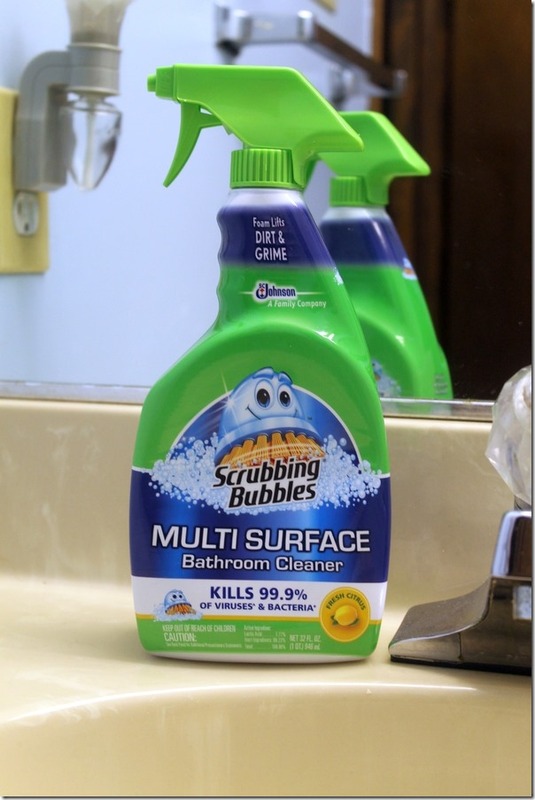 Scrubbing Bubbles® Multi Surface Bathroom Cleaner kills 99.9% of viruses and bacteria, which was super important to me because I just got over a major cold before the party. I didn’t want my lingering germs to send my guests home with unwanted holiday gifts. Plus it gets rid of hard-water stains, something I struggle with since I have a well. The best part: Scrubbing Bubbles® cuts way down on the amount of work you have to do to clean your bathroom. I spray it on all my surfaces, give it a few minutes to do its job while I tidy up my towel rack and other visible bathroom storage areas, then go through and wipe everything clean. Scrubbing Bubbles® has 40+ years of experience in helping you clean your bathroom, so they’ve pretty much mastered the process of keeping the Complete Clean! Whether you’re cleaning your bathroom for a huge party or just doing your weekly 20 minutes, Scrubbing Bubbles® cuts through the mess and lets you open those bathroom doors without embarrassment. I shared my embarrassing secrets, now tell me yours! Leave me a comment with just one of your scary bathroom habits and I’ll feel so much better! For more information about Scrubbing Bubbles®, visit ScrubbingBubbles.com or Facebook.com/ScrubbingBubbles. Now I know how to get that stubborn dye up! Thank you!! You have to act kind of quickly though for the best results, but it definitely works! Although I did have success in seriously fading an old stain on my counter! I have used scrubbing bubble on several stubborn stains in my kitchen on the counters!! Love Scrubbing bubbles always does the job! It works GREAT on shower doors. I have those doors too. I kind of miss curtains. When we moved in I thought “yay, cool doors!” Now, I think, at least with curtains I could just wash them! I am going to have to try this on the mystery stain in my sink. Really, I have no idea what it is… it’s just a blue streak. I have little kids, so I don’t even want to know half of what goes on in my bathroom. I just try to keep it as clean as I can. I have actually used this in my kitchen sink because it’s white and holds onto every possible stain! I love the scrubbing bubbles products, they really work wonders on tough to clean areas in the bathroom. Scrubbing Bubbles have always been a favorite in my house. I spray everything down and wash it before it dries and it’s amazing with my white shower, sink, tub, etc. White is generally hard to keep clean looking as it need to be cleaned pretty much daily, but I don’t have to clean it every day when I use Scrubbing Bubbles. Scrubbing bubbles is amazing. We’ve used it in our bathrooms for a while now and what a difference. It stays clean for much longer too and with 6 little kiddos who are rather messy, it helps so much! I’ll have to tell my mother in law about this! Like you, she frequently dyes her hair at home and sometimes has a hard time cleaning the dye off the bathroom. I’m blonde, so get my hair done at a salon- and luckily at home, the dye that does wash out isn’t noticeable! I definitely spend a lot of time cleaning my bathroom, but that is because I am a neat freak all over the place. I use Scrubbing bubbles too. They make it so easy to clean out the tub and shower! And I share your hair woes. I also have long hair, and am in the stage after giving birth where all your extra hair starts to shed It’s so crazy! In the past I just cut my hair at this point, but now I really want to keep it long. Lucky, I haven’t clogged up a drain yet. Scrubbing Bubbles are my fav products. I think I use all of them including this, the toiler cleaner that you can flush, the toilet gels, the foaming bubbles, everything. Thanks for this post, too. I’m such a fan and now you are, too. LOL! I am so skeptical about so many cleaning products. You know what my trouble is? Cleaning the shower and have it sparkle. It’s SO hard, because we don’t have a removable shower head, so cleaning the walls and the other side of the tub is tedious. I don’t think I’ve tried scrubbing bubbles before, but I saw it at a blog conference once, and the guy demonstrating it made some crayon marks where the tile grout was, and the scrubbing bubbles didn’t take it off!!! LOLOLOL. Bad marketing on his part, haha. i really like scrubbing bubbles, it makes my bathroom worth going into now,it works more than i do. I’ve been using scrubbing bubbles for a long time and I love it. It’s amazing how clean you can get your bathroom! Thank you so much for sharing this fun review! I had to chuckle reading this! With my 13 and 6 year old boys sharing a bathroom with my 3 year old daughter – the arguments between them are plenty! Mostly coming from the little diva because her brothers just don’t get it. I really like and recommend Scrubbing Bubbles. It work so fast and well. As a professional cleaner I often clean bathrooms so I am very interested in trying this bathroom cleaner! I think that they don’t have it the UK so I hope that I can order it through ebay. Thank you for the review! Greets, Ora!